Legends Romona Keveža Spring 2020 takes us back in time to the glamour of the Rainbow Room of Rockefeller Plaza in the 1940‘s and 1950’s. The opening look, a ball gown with a sequin Damask lace bodice, captures the allure of that historic time with a flowing organza cape and is followed by a sequin Damask lace gown highlighting a plunging deep V-neckline and V-back.An organza ball gown with illusion boat neckline is reminiscent of the classic style of Audrey Hepburn. A silk shantung ball gown featuring a deep V-neckline and circle skirt with a slit evokes the sensuality of Elizabeth Taylor. We are then introduced to re-embroidered French lace and Chantilly lace with two A-line silhouettes, one featuring a low illusion neckline, the other showcasing a boat-neckline and long sleeves. A romantic off-the-shoulder gown with a soft A-line skirt is followed by a fluted luminescent embroidered silhouette that highlights a deep V-neckline. 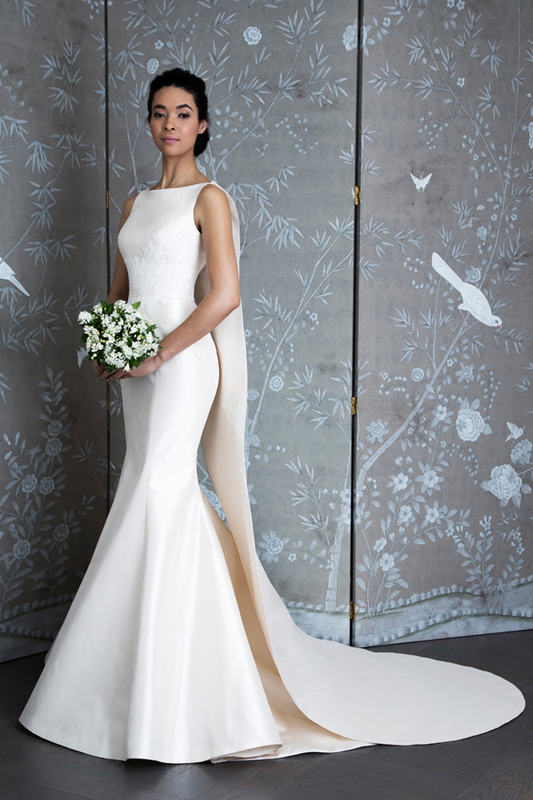 A delicately beaded Alencon lace neckline adds the perfect hint of femininity to an A-line ball gown and a silk satin gown, with empire pleated detail, is inspired by the elegance of Lena Horne. The finale gown, an ode to Jackie Kennedy’s signature style, features a cut-out neckline and a dramatic pleated ball gown skirt. The Legends Romona Keveža Spring 2020 collection is polished and refined yet playful and romantic, echoing the spirit of the iconic Rainbow Room and inspiring today’s bride to “Be a Legend In Her Own Time”. When Grace James started the hunt for the perfect wedding attire, she had two requirements: She wanted to match her vintage, eclectic style and the vibe of her venue, the Bond Chapel at the University of Chicago. Mrs. James found both in a Legends Romona Keveza gown. “I felt fancy, classy, and like there will be no way I’ll look back in a year, or 20, and say, ‘What was I thinking?’,” said Mrs. James who paired her gown with a headpiece by Debbie Carlisle, jewelry by Lulu Frost and a rhinestone belt made of trim she bought at a fabric store. 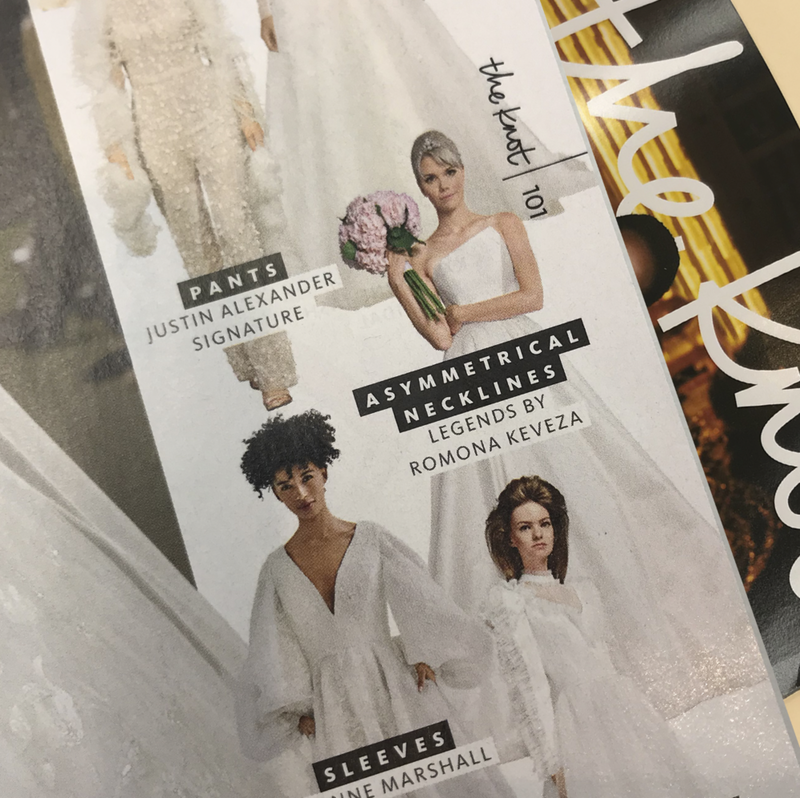 @martha_weddings selects @legendsromonakeveza Spring 2019 Style L9125 as a top gown if you want to recreate the Duchess of Sussex’s bridal look.